For the first time, Border Patrol agents and Mexican federal police officers are training together, sharing intelligence and coordinating patrols. It is a joint attack on northbound flows of drugs and migrants, and southbound shipments of guns and cash. This story was co-published with The Tribune Washington bureau. NOGALES, ARIZ. -- In a politically sensitive operation at the Arizona-Mexico border, U.S. Border Patrol agents and Mexican federal police officers are training together, sharing intelligence and coordinating patrols for the first time. The goal of the historic partnership: a systematic joint attack on northbound flows of drugs and migrants, and southbound shipments of guns and cash. It is part of a major, unannounced crackdown started in recent months that involves hundreds of U.S. and Mexican officers in the border’s busiest smuggling corridor. The initiative appears likely to expand. Homeland Security Secretary Janet Napolitano and Mexican Public Safety Secretary Genaro García Luna will sign a declaration Thursday in Mexico City agreeing to replicate the experiment elsewhere. Eventually, officials say, joint operations border-wide could lead to the creation of a Mexican force serving as a counterpart to the Border Patrol — an agency once regarded with nationalistic aversion in Mexico. Political urgency drives both sides. The Obama administration needs results on border security in its uphill campaign for immigration reform. Mexican President Felipe Calderón’s government wants progress in its high-stakes war on drug mafias. But the unprecedented effort faces imposing obstacles: violent drug cartels, long-standing Mexican reluctance to interfere with illegal immigration into the United States and a legacy of corruption that has scuttled past enforcement efforts. In the 1990s, the Border Patrol worked closely with Grupo Beta, an elite Mexican police unit. After a promising start, the unit faltered under allegations of wrongdoing and functions today as an unarmed humanitarian agency. Nonetheless, Tuesday’s visit by Treviño, 69, was full of signs that times are changing. The lean, white-haired, retired army general has served for a year in the federal preventive police, which conducts street-level enforcement involving major crimes and patrols highways and airports. Treviño watched a training session in which green-uniformed U.S. instructors shouted directions as nine Mexican officers in blue uniforms, goggles and helmets roared through mud and water on all-terrain vehicles that the Border Patrol uses to chase border-crossers. Mexican officers, who undergo U.S. background checks, also train in close-quarters firearms techniques and medical rescue skills. The Border Patrol plans to vet and train several hundred Mexican federal officers who also will learn behavioral analysis and ways to detect contraband concealed in vehicles. The center of the action is the twin cities named Nogales. The American town has a population of 30,000 and a downtown dotted with shuttered shops. The federal government is the main employer. Economic woes have forced the city to close three parks. The Mexican Nogales has 10 times the population and sprawls across a congested valley. It has historically been one of the main routes for shipments of fruits and vegetables going north, a route that is now shared with the illicit flow of immigrants and drugs. Although violence has not reached the crisis levels of Tijuana or Ciudad Juarez, upscale restaurants are often empty because of fear of violence. After lunch in the U.S. Nogales, Treviño and his aide, Inspector Carlos García, accompanied Border Patrol supervisors on a rattling hour’s drive on a dirt mountain road to inspect a base housing a dozen live-in Border Patrol agents. Treviño plans to set up two “mirror” bases for his officers south of the U.S. outposts to pursue smugglers, who use horses and ultra-light aircraft in the rugged terrain. As they drove, the men traded stories about the dangers of the border. Border Patrol supervisor Juventino Pacheco, who works as a liaison to Mexican law enforcement, told of a recent shooting attack in Nogales, Mexico, on a municipal police commander and his family. The commander suffered moderate wounds. A bullet grazed the finger of his 8-year-old son. The commander was hospitalized in Arizona for his safety, and Border Patrol agents stationed at the hospital described to Pacheco the boy's remarkable reaction. García shook his head and leaned forward to pat Treviño on the shoulder. The joint U.S.-Mexican operations got under way here when a detachment of Mexican federal police arrived in Sonora about two months ago. They began communicating daily with the Americans and responded to security threats, disrupting smugglers’ hilltop lookouts and breaking up rock-throwing gangs who frequently clash with U.S. agents in melees that have resulted in injuries, shootings and diplomatic tensions. “There has been a decrease in rockings after their deployment,” said Al White, the Border Patrol agent-in-charge in Nogales. The Mexican forces also have developed new southern barriers to smuggling drugs and people. Treviño has deployed five roving checkpoints in Sonora that have pushed marijuana traffickers west from traditional land routes to more complicated maritime smuggling on the Sea of Cortez, officials say. The Border Patrol will send two liaison agents to Treviño’s headquarters in Hermosillo; two Mexican officers will work at the Border Patrol station in Nogales. However, Treviño said that while his officers aggressively pursue smugglers and arrest non-Mexican migrants, they do not intend to interfere with Mexicans crossing north illegally if there is no evidence of other criminal activity. The policy is dictated by longtime Mexican political sensitivity and public opinion, experts say. Nonetheless, Mexican Ambassador Arturo Sarukhan praised the Arizona-Sonora model as part of an enforcement “sea change” resulting from close government cooperation and the increasing frequency of drug traffickers who also smuggle people. Former U.S. immigration commissioner Doris Meissner said Mexico’s new attitude toward border enforcement is a result of Calderón’s focus on public safety, a post-9/11 awareness of terror threats and the fading of the sometimes strident Mexican nationalism of the past. Meissner participated in a conference last year at which former Mexican and U.S. officials, academics and other experts proposed reforms including the creation of a Mexican force that would mirror the functions of the U.S. Border Patrol – a source of inspiration for the Arizona experiment. Border Patrol officials say the Mexican anti-smuggling effort helps disrupt the flow of illegal migrants and is the most they can hope for at the present time. Smugglers have retaliated against the five-month U.S. crackdown, dubbed the Alliance to Combat Transnational Threats. Gunmen with automatic rifles wounded a Border Patrol agent in December. A month earlier, a hilltop sniper on Mexican turf fired volleys at the U.S. port of entry, causing havoc but no injuries. Officials suspect it was payback for the seizure of $300,000 by U.S. inspectors. 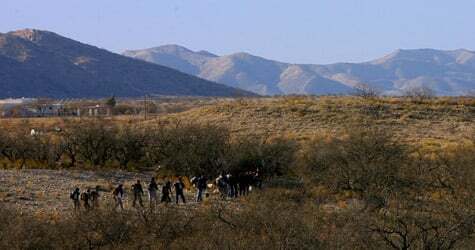 In addition to the more recent cooperation with Mexico, U.S. border agencies have deployed extra personnel in the Tucson sector, which leads the southwest border in arrests and marijuana busts. They have begun concerted scrutiny of southbound traffic and pedestrians, a rare practice at the international line. The checks have enabled inspectors to seize $2.2 million in smuggled cash and identify more than 3,000 illegal immigrants since October. Although U.S. officers have seized only five weapons in that period, Mexican customs inspectors found 41 assault rifles hidden in a vehicle a month ago. The bolstered defenses have caused an odd reverse scenario: Smugglers based in Tucson and Phoenix occasionally try to smuggle people and goods south into Mexico, officials say. Meanwhile, the Sinaloa drug cartel has launched an offensive to take control of Nogales, Mexico, from the Beltran Leyva cartel. January brought 40 killings in the city of 300,000 and a spate of attacks on police officials. There are fears that gangsters could target the Border Patrol’s new Mexican allies. The cultural change reflected by the joint operation seems profound. For years, the Border Patrol had a negative image among many Mexicans and Latinos, fed by movie screen stereotypes of sadistic, racist agents. The caricature obscured the reality that many U.S. border agents are Latino and that the Border Patrol has improved relationships with Mexican consulates and migrant advocates. But U.S. and Mexican officers admit the alliance would have been hard to imagine a few years ago. Not to mention the scene Tuesday evening at the Border Patrol station: At a ceremony where Mexican officers received certificates for their training, Treviño congratulated them in front of a U.S. flag and a Mexican flag that Border Patrol agents borrowed for his visit.